The Ridgeview Deluxe is a fun-filled play frame from Selwood which features a wide range of accessories to keep children amused. 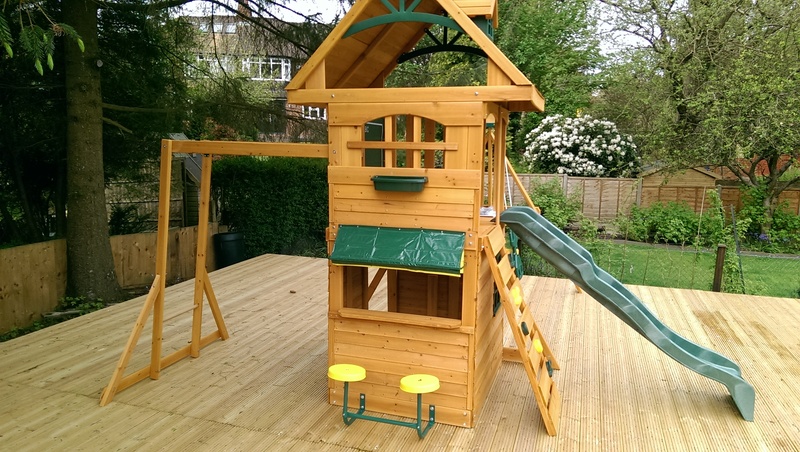 The Ridgeview Deluxe climbing frame includes a wooden play tower with a play deck for kids to climb to, a rockwall ladder, slide, monkey bars, a swing set, a lower play cabin with a picnic bar and stools plus a chalk board inside the play fort. 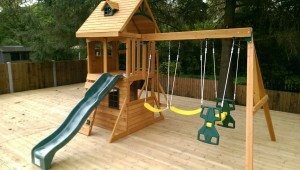 The Ridgeview Deluxe playset is designed with medium sized gardens in mind as it is slightly more spacious than some other play frames from Selwood which are more suitable for smaller gardens such as the Holt, the Balmoral Fort climbing frame, the Orton and the Duchess just to name a few. 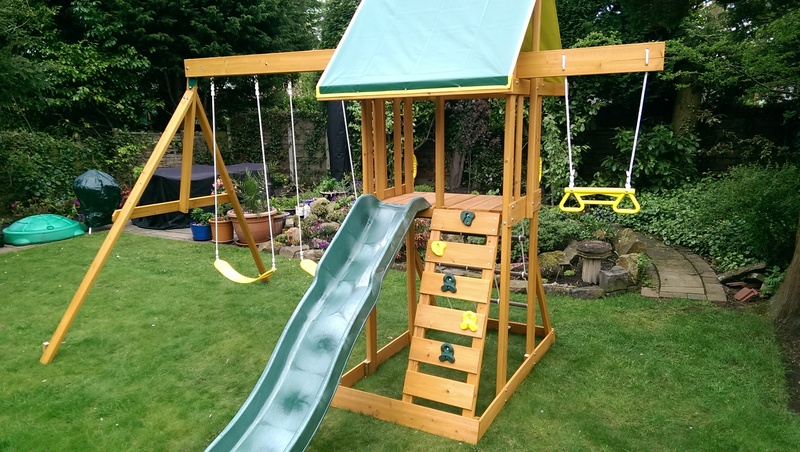 Selwood also stock climbing frames which are larger than the Ridgeview Deluxe if you are lucky enough to have space in your garden for a larger playset. 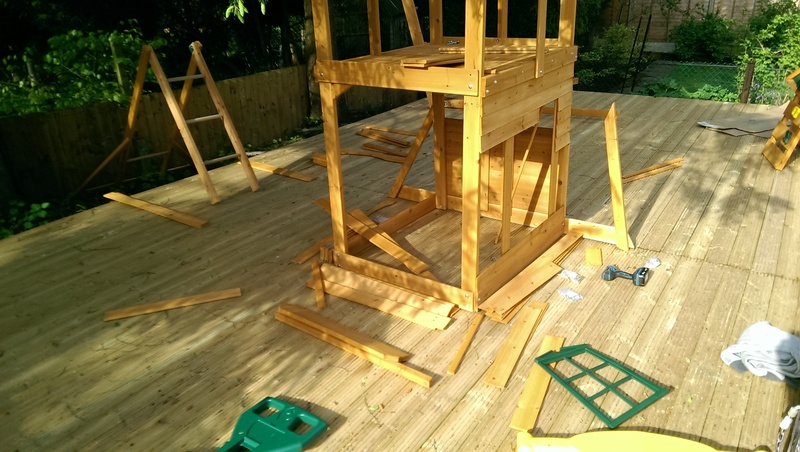 Climbing frames from Selwood are engineered and pre-drilled with self-assembly in mind, however you may want your playset installed by professionals. Our team of experienced playset builders offer a professional but affordable installation service for anyone who does not have the time or confidence to build a DIY climbing frame. Our climbing frame installers can ensure your play centre is quickly and correctly installed and safe to play on. 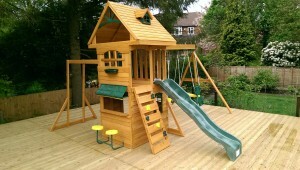 The Ridgeview Deluxe play centre includes a play tower as the main part of the climbing frame, with a wooden pl ay deck for children to climb to. The play deck is enclosed by wooden railings which keep little ones safe while playing in the play fort. The railings also allow parents to supervise while children are playing in the play tower. The play deck is sheltered by a wooden roof which offers protection from wet weather and also direct sunlight on hot days. The back wall of the play fort features a chalk wall for children to practice writing and drawing on while playing in the play deck. 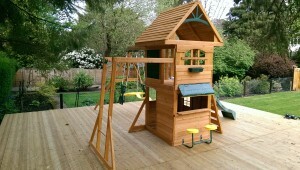 The Ridgeview Deluxe features a rockwall ladder at the front of the playset plus monkey bars at the back of the play fort, both of which children can use to climb to the play deck. The monkey bars at the back of the climbing frame are a slightly more challenging accessory for kids to develop strength and coordination on. They are also a great way to keep older children interested in the playset. Children can also climb the rockwall ladder at the front of the playset to reach the play deck. The rockwall ladder is a popular accessory which features in a lot of the climbing frames in the Selwood range. The rockwall hand and foot grips are a fun way for children to test their climbing skills, plus the ladder provides an easier climb for younger ones to reach the play deck safely too. 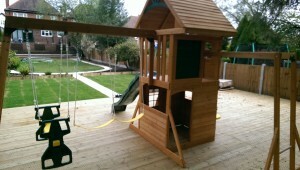 Another feature of the Ridgeview Deluxe climbing frame is the swing set to one side of the play fort. The swing b eam includes two flexible belt swings as well as a two seater glider swing, which makes this playset ideal if you have two or more children in the family. The glider swing encourages children to play together and is a fun alternative from the single belt swings. 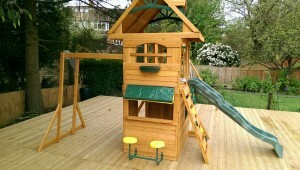 Beneath the play deck there is an enclosed lower play cabin for children to play in. The playhouse has plenty of space for a group of children to play at once and it even includes a window at the front and picnic bar to one side of the play cabin. The lower playhouse features a window hatch at one side which doubles up as a picnic bar with two picnic stools on the outside for children to sit at. The Ridgeview Deluxe play centre from Selwood is certainly jam packed with activities and will keep children amused for hour s. This pretty playset can provide hours of fun for the whole family and is a great way to keep children fit and active. For more information visit www.selwood.com. 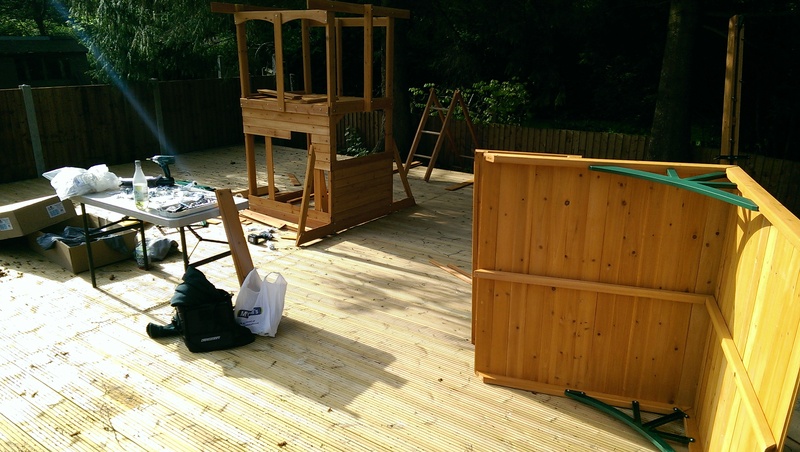 For help with the installation of your climbing frame, contact the climbing frame installers today. Our team of certified playset builders have years of experience in assembling children’s play frames and can ensure your playset is correctly and safely installed in no time. For a quote please call 07792309588 or email us at: [email protected].